For breakfast I mixed up a huge Green Smoothie for the office. What you can see on this picture is actually only half of it which I had to drink at home. It was just too big for my tumbler. The Smoothie consists of coconut water, frozen pineapple, mango and papayas, spinach and ½ scoop vanilla protein powder. Very good. 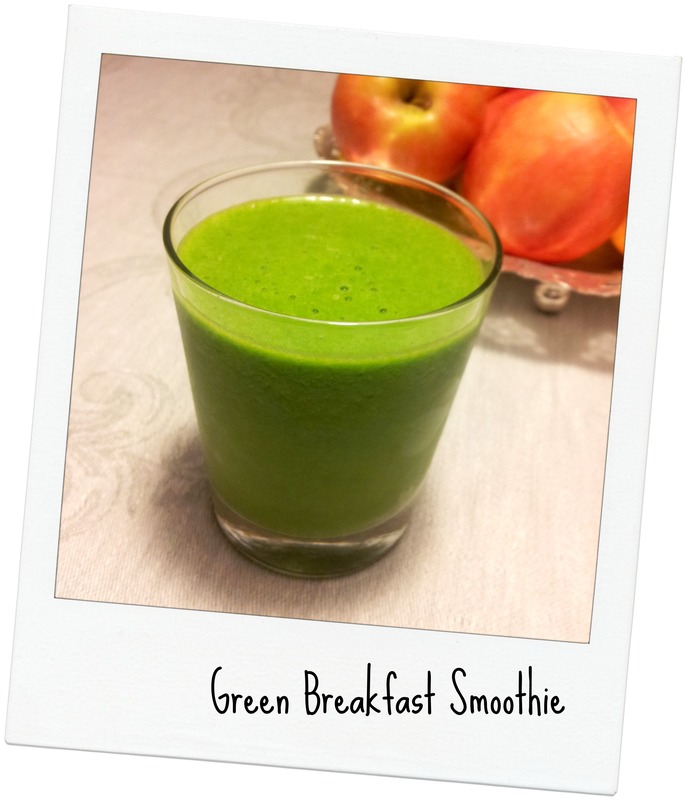 This was the first Green Smoothie experiment with my Thermomix and I have never had a smoother Smoothie before. The Green Smoothie nevertheless wasn’t too filling so when the clock hit noon I was starving. One of the key points of my own meal plan is to include veggies in as many meals as possible. 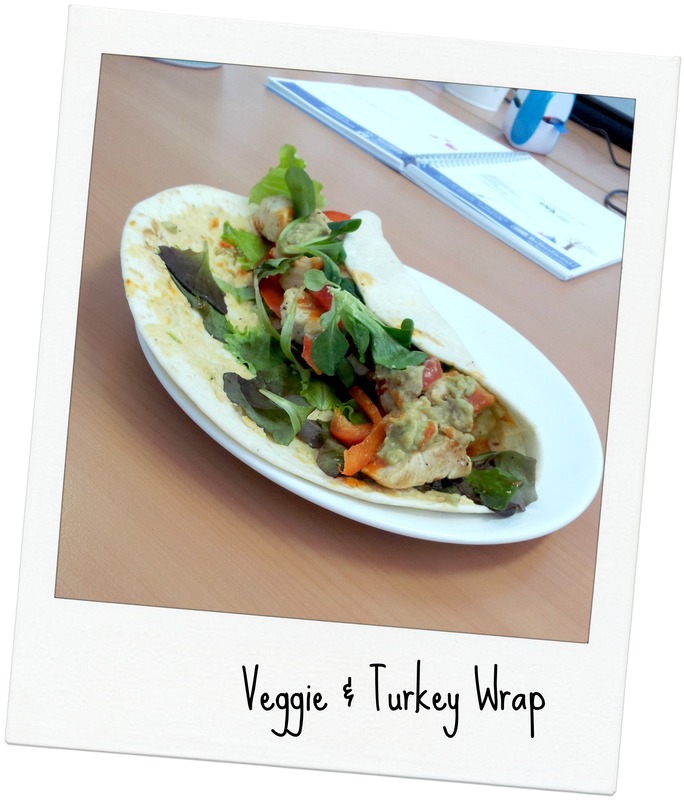 For lunch I also need to eat some carbs and protein so I decided to make it a wrap on Tuesday. Filled with hummus, lettuce, bell pepper, turkey breast and some leftover guac and topped with a holy lot of sriracha. Eating this monstrosity definitely was a challenge 🙂 Yet one I gladly accepted. Then I brought my husband to his soccer practice and then headed for my Power Plate training. I was still horribly sore from the kickboxing and hill sprints. Especially shoulders and arms suffered from this unfamiliar exertion. But I was happy to challenge myself again. I managed to make 31 push-ups in 60 sec on the plate last week. That means I can work on the deepness now. And my goal was to cut back to 20 but do them all in a 90° angle. I’m not sure if they were all that deep but way deeper than before. I was happy with my progress 🙂 I feel like I am back in my workout mode and I feel very very comfortable about that. I just can’t stand the lazy me! When I came home I made dinner for us. 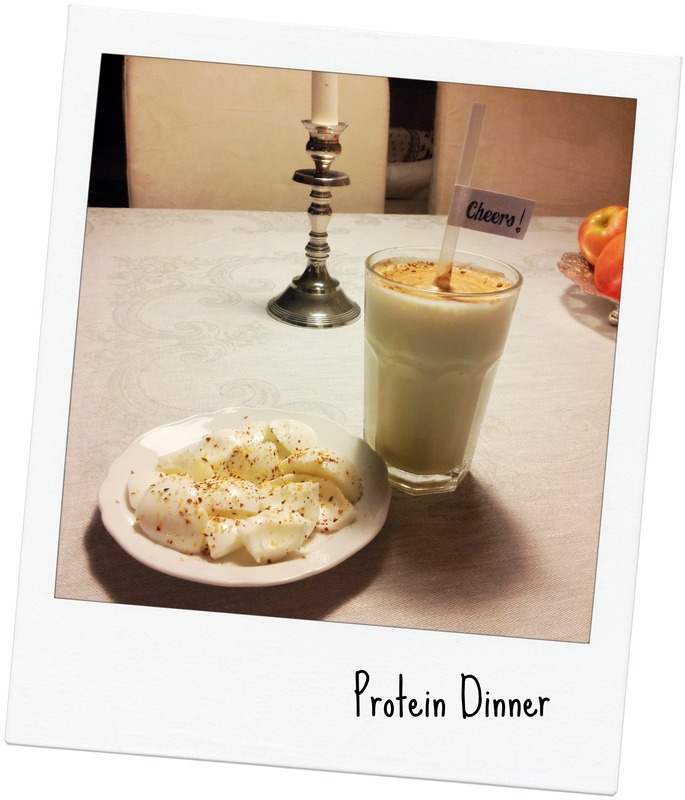 A vanilla protein shake and some egg whites with chili. Not super thrilling but it satisfied any craving I had at that moment! I also chopped veggies for my Wednesday afternoon snack. My husband came home at 9.30 pm and we made ourselves comfortable on the couch. That wrap looks delicious…you can NEVER have too much sriracha..except if you have a cut on your lip. Yep, that happened. 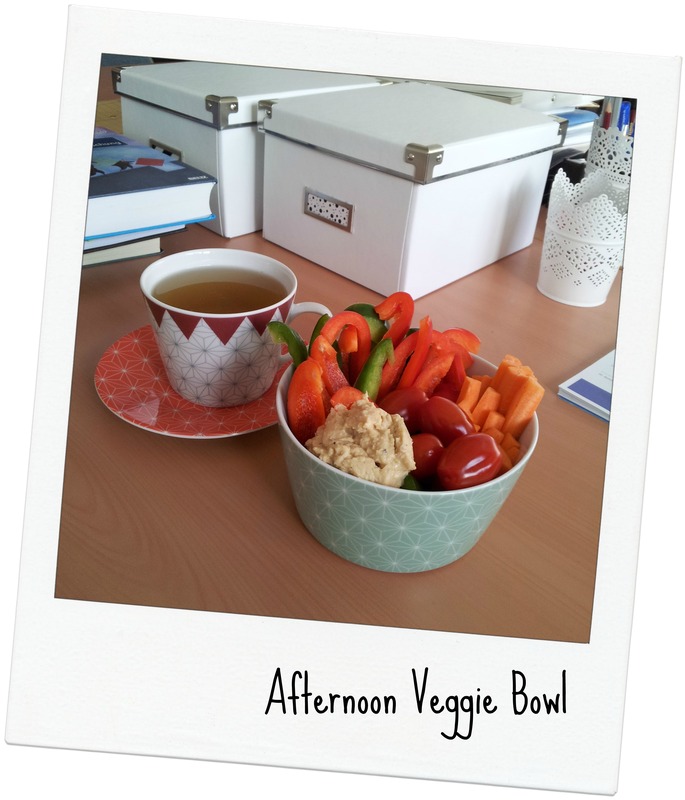 The bowl of veggies and hummus looks awesome, lady! Exactly the writer’s snack I crave right now. I still need to read up on the epic post you wrote yesterday and I will comment on that one as soon as I manage! Regarding the smarty-pants PhD way of speaking: I totally get you. When I write the thesis and start talking to people I a) use words I would never use in a normal conversation and b) start speaking in German to the international people sitting next to me here in France 😀 guess that’s a sign for concentrated work. Cute bowl, plate and mug! I like the design on them. Yes I blame the liquid consistency too. I think it’s just easier to digest and therfor leaves the stomach faster. But I love me my smoothies!!! I still can’t get over those adorable labels on your straws. I need to bust out some tape and make a ghetto version myself, I think 😆 And I’m loving the random dinner — sometimes I’ll have a chicken salad with a bowl of cereal on the side. Gotta satisfy those cravings, right? And thank you for reminding me that I really need to up my veggie game. I’ve been slacking big time lately. In my books the chicken salad cereal combo sounds great! Those cravings are telling us what we need. So why not giving in? Haha you’re very welcome. I need to remind myself constantly, too! Love that straw you used in your smoothie at dinner, so cute! Good on you for putting together your own meal plan, you’ve got to do what works for you. I really want a thermomix now too, seeing and hearing about your amazing green smoothie! Thank you 🙂 I think so far it works out just fine. I’ll see how I progress. Oh, you will so love the Thermomix! It isn’t cheap at all but you’ll be rewarded for sure! I absolutely agree! I am actually hungry at lunch time now and don’t miss the snack at all. And if I am really hungry I can always eat something, right?